I met middle grade author Kristi Wientge at this year's Asian Festival of Children's Content. She told me that her first book would be coming out soon. That was then. 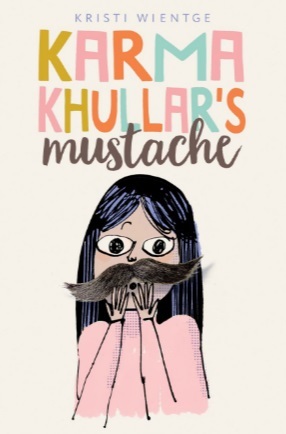 Karma Khullar's Mustache is published by Simon & Schuster, and it's now available in stores. I couldn't believe my ears when Kristi first explained what her book was about. I'll let her tell you about it in the interview below. She also answers questions like: What does it take to find a literary agent and get your first kidlit book published? How is one able to maintain a steady schedule working on books? And taking care of kids at the same time? Etc. BTW I also featured her daughter Nela's book project earlier, here. 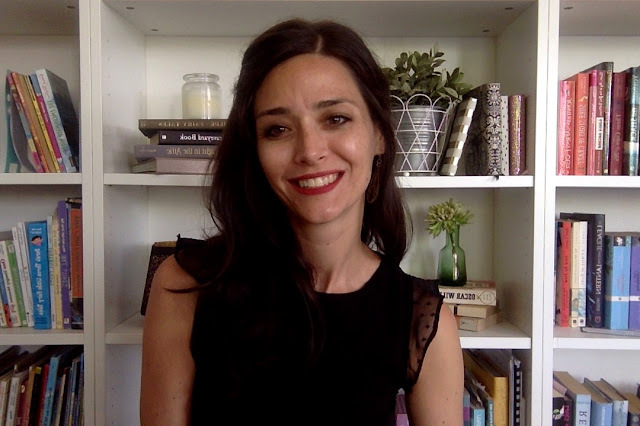 Kristi's social media links are at the end of this interview, feel free to connect with her, particularly if you can identify with the main character in Karma Khullar's Mustache. Tell us about yourself, and your new book. Hi, everyone. 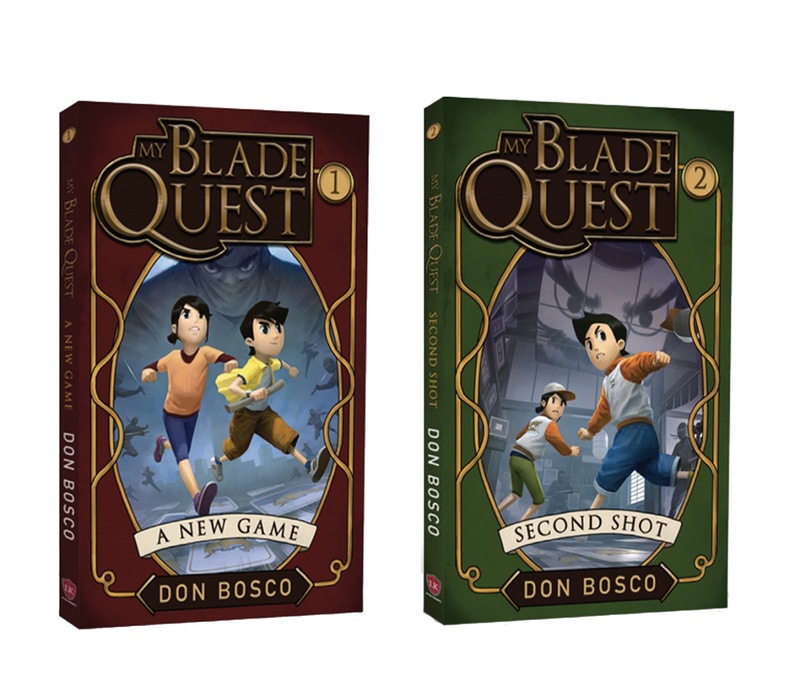 I’m Kristi Wientge and I write Middle Grade books. I’m originally from the US, but haven’t lived there for about 20 years and have been in Singapore now for over 12. My book is KARMA KHULLAR’S MUSTACHE. It’s about Karma, a 12 year-old girl. Things at home, school and in her personal life are all kind of crumbling. What really bothers her though is the hair that’s growing on her face. Karma feels like there’s no one who understands her problem and it’s not an easy problem to talk about with other people. So, she spends most of the book trying to figure things out by herself. Awesome story idea! What inspired this? This story is something I’ve wanted to write since I was young. Actually, to put it more accurately, I wanted to read a book about a hairy girl since I was young. Growing up I felt a lot like Karma—like I was the only girl with dark hair, the only girl with hairy arms and legs. I have two brothers who teased me and my parents were busy with the company they ran and my friends weren’t hairy. I didn’t know who to talk to about it. So, I didn’t. I dealt with it on my own and kept it buried like something I should be ashamed of. It wasn’t until after university that I met an amazing girl who is still one of my very dearest friends and I could discuss it candidly. I didn’t want that for my girls or any other girl. 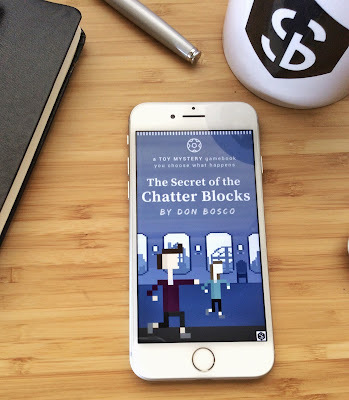 I wrote this book to open the conversation and put a spotlight on something that is way more common than we think. You're based in Singapore but represented and published in the US. Could you share some tips on how other writers can make this happen for themselves? Sure! Anyone in the world can get an agent from anywhere in the world. Probably your biggest concern would be taxes. From my understanding, most agents are based in the US and UK. As far as I know, Australia works similar to Singapore in that you submit your work directly to a press or editor at a publishing house. I chose to go the agent route mostly because I’m horrible at sales and marketing. Seriously! I actually have a box of my author copies hidden under my bed! The other benefit of having an agent is the extra editorial boost. My agent and I worked hard on my manuscripts and did at least 4 rounds of changes and edits before we sent it off on submission to editors. It was hard work, but it also meant that we had minor changes to do with the editor at Simon & Schuster. Also, agents do a lot of the hard work and have way more connections than most of us. If you’re looking at the US or UK market you should know that most publishing houses don’t accept unsolicited manuscripts—which basically means you have to have an agent. Of course, agents take a percentage of your earnings, but that is fine by me! My agent shopped my book around to editors she knew would be interested in a book like mine, so it saved us a lot of time. Also, she negotiated my contract and knew all the things to fight for and all the right questions to ask. Looking through the sites and noting agent’s preferences will help you narrow down who to query. Good luck! Kristi says: Here’s my writing desk (where I NEVER write! From your Instagram: you juggle parenting and writing! How do you plan your time? Any tips or tools to share? Juggling is the perfect metaphor for writing with children! I often drop a ball somewhere. I think the biggest thing I’ve learned is to give myself a break. My house is not as clean as I’d like it. Sometimes we eat the same meal for 3 days. Often times I don’t even get through half my checklist for the day. This year, my eldest has been preparing for the PSLE, so I’ve been doing my best to just be present and supportive and helpful to her. My mornings are jammed packed Monday to Wednesday, so I really only have Thursday and Friday morning to get my writing done. I say no to a lot of coffees and lunches because I try to protect my writing time and treat it like a job because once it turns 1.30, it’s all about my kids. BUT once it hits 8pm, I tell my kids that I’m off duty. I’m not super productive at night, but I can be if I’ve had a crappy writing morning. Still, like I said, sometimes I just have to tell myself, it’s okay and binge watch some Netflix and start the next day with a new perspective! Kristi says: But here is what it looks like when I’m writing (dining table).